What’s Your Card? | Sondra Barrett, Ph.D. | Sondra Barrett, Ph.D.
Home / What’s Your Card? Have you ever wondered if there is a bigger story of who you are, at the metaphysical, symbolic level. You can uncover some of your magic through Tarot and Astrology. I use two different systems to explore the gifts of your birth date in the realm of metaphysical discovery. One system AstroElementals and the other is What’s Your Card. “What’s Your Card” is based on ancient system of the 52 playing cards, tarot, numerology, and astrology. 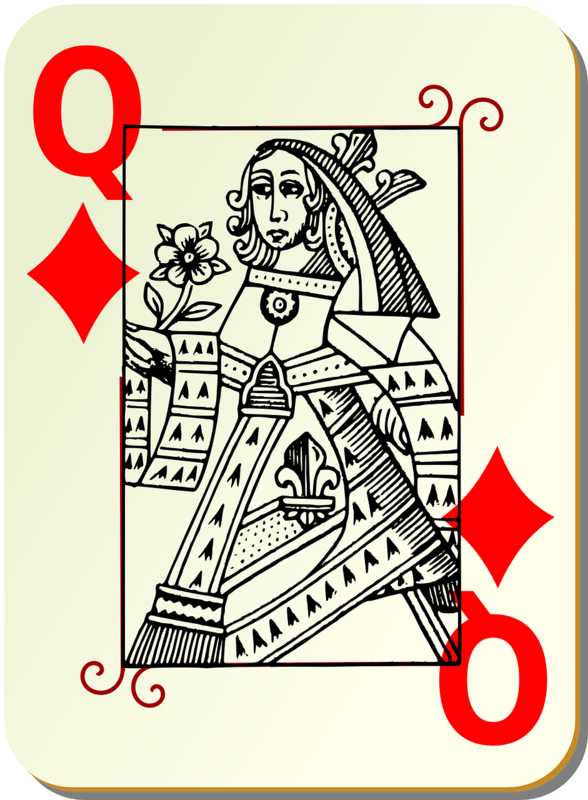 In this symbolic system every birthday has a card (based on the 52 playing cards, astrology and tarot. 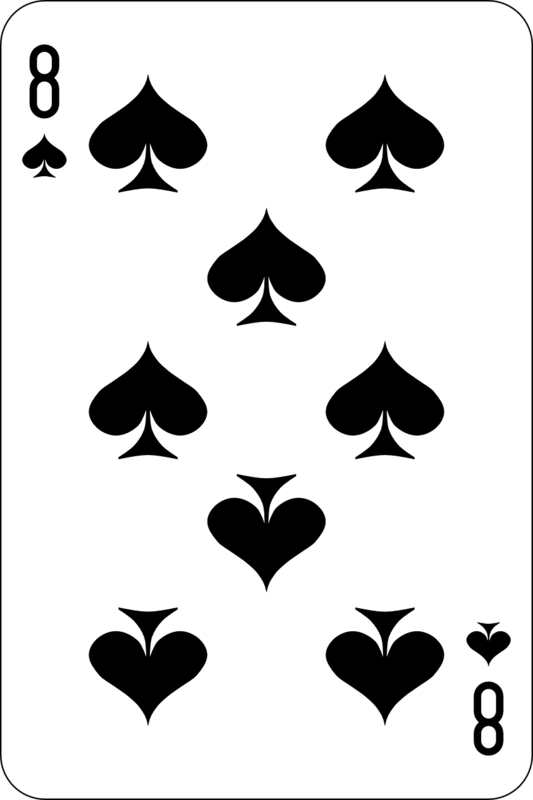 The playing cards originally were thought to be symbols of hidden esoteric and secret knowledge. What Your Card shows your symbolic life path, the flow of life and what the next year or years may bring. It also can show you about the essence of significant relationship connections. When I meet someone new I always check them out in the What’s Your Card book – do they have positive and direct connection to me during my life, this year or next, and what about a spiritual connection. It’s a fascinating way to help build your confidence in your intuitive sense and inner knowing. It can also reveal times of change, confusion,or romance. The symbols can tell you about your life path, your work and mission here on Earth as well as what’s going on right now this year, last year or the next. 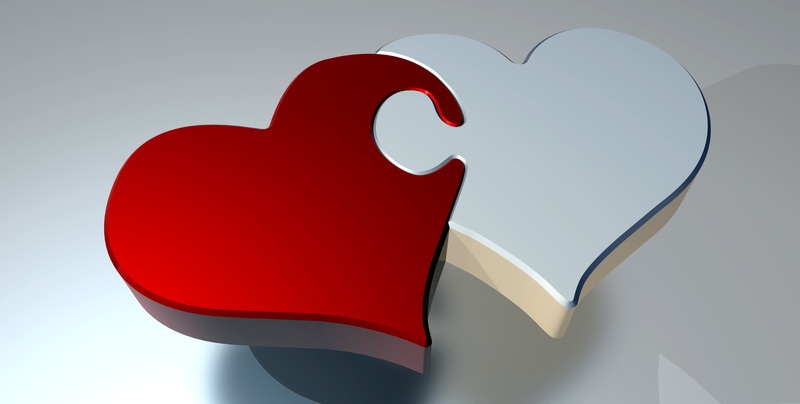 We can also look at significant relation-ships or potential relationships in your life. Find out how that person may fit in your life. Knowing your self in a symbolic metaphysical way can lead to enriching your sense of self, your purpose, your essence and strenghthen your inner knowing. What’s Your Card can help guide you to deeper knowing, better decision-making, trusting your intuitive knowing, planning and seeing the patterns of relationships in your life, now, and in the future. What’s Your Card Reading (aka Destiny Cards) Your soul purpose and where you are now in your cycles of time. 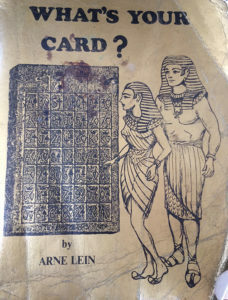 I use the complete original information in the out-of print book What’s Your Card. 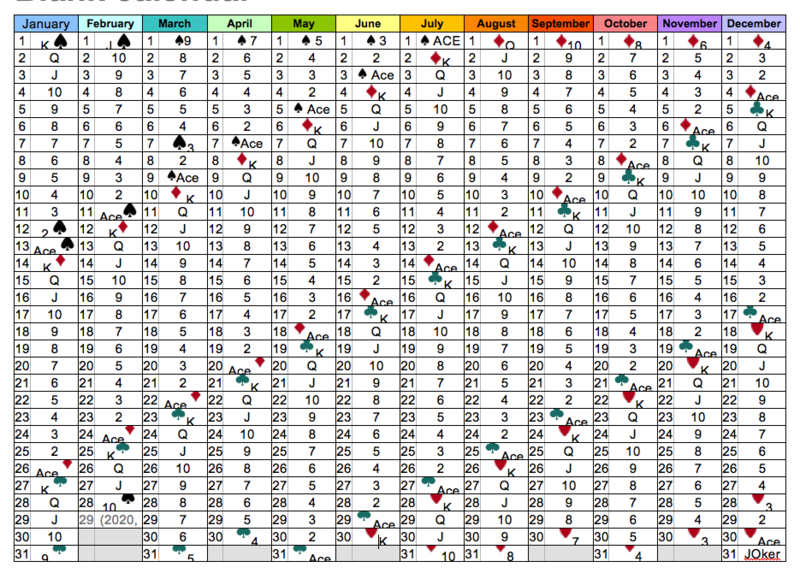 Here’s is the calendar of birthdays and their cards. Jus look up your birthdate and you will discover YOUR card. Explore what that card means for you, the meaning of the number and suit, its placement in the life path, and in a reading you can discover this year’s placement, what the year has to bring you. You will learn a lot about yourself and after the initial session you may even have enough information to look up your friends, family, and new people you meet. With “What’s Your Card” I diverted myself from getting into a disastrous relationship – I was attracted to the guy but his card and placement told me to be patient and wait before I leaped into an intimate relationship with him. This supported my intuition to be cautious with this man and I later saw that he was not honorable. Saved by the cards! A one hour reading is $150. Reserve your time now. "I find myself asking questions — where does knowledge come from, how can we make it useful for healing. That is what a scientist does — asks questions and looks for answers." Copyright © 2018 Sondra Barrett, Ph.D. - All Rights Reserved.